Many years ago, I was "accused" by the Late Loren McIntyre, the distinguished photographer and South American explorer, of throwing apples and oranges at him. The issue had to do with a statement he made in a specialty magazine that the Amazon river did not have 1/5 of the world's water; that this number was more likely to be 1/10000. Being knowledgeable on the subject, I was eager to set the record straight, and convinced the editor of the magazine to publish a correction, hoping to shed light on the issue. And so I did. To compare the Amazon's annual supply of fresh water to the total amount of fresh water on Earth is one thing; I called this an "apple." On the other hand, to compare the Amazon's annual supply of fresh water to the annual supply of fresh water that returns to the sea from the land (the river runoff) is another thing; this I called an "orange." McIntyre was referring to the apple, but when people talk about the Amazon's water, they are usually referring to the orange. In fact, my own calculations confirmed that the Amazon's runoff was about 1/6 of the world's total runoff. Needless to say, the confusion between volume and discharge remains common among laymen. 1 Ponce, V. M. 1992. "Letter to the Editor." South American Explorer, 31, 37. 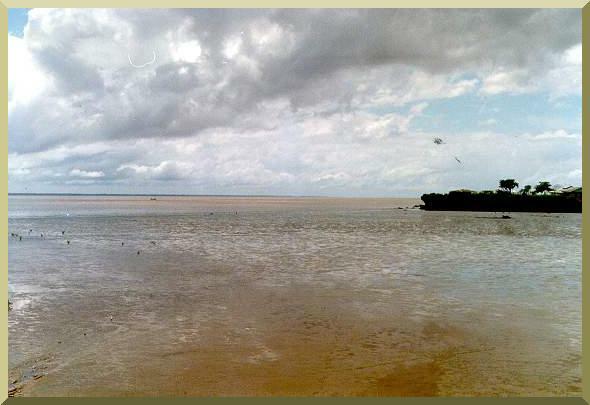 The Amazon river at its mouth in Macapa, Brazil.